President Lyndon Johnson delivers his State of the Union on Jan. 8, 1964. 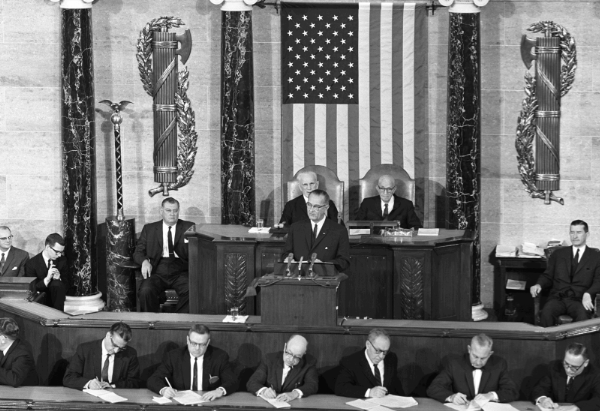 President Lyndon Johnson delivers his State of the Union address on Jan. 8, 1964. Go to any public place in Oklahoma with a broad cross-section of people and take a look around. Every sixth Oklahoman you see, on average, will be officially poor. That’s a big improvement over 50 years ago, when the average was closer to one in three. 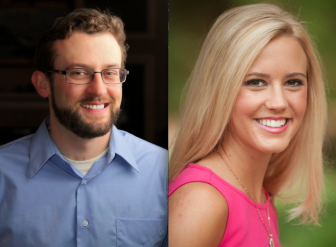 A duel of opinions: Has the ‘War on Poverty’ succeeded or failed? Much of the progress came during the decade following President Lyndon Johnson’s Jan. 8, 1964, promise to wage an “unconditional” war on poverty. Congress followed up by expanding Social Security and food stamps and launching programs such as Medicare, Medicaid, Head Start and Job Corps. • While Oklahoma’s official poverty rate fell from about 30 percent in 1959 to 17 percent in 2012, it remains stubbornly higher than the national rate, which declined from 22 percent to 15 percent over the same period. 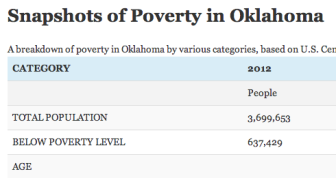 Oklahoma is still a comparatively poor state, with the nation’s 16th-highest poverty rate. • Oklahoma’s poverty population is increasingly young. The poverty rate for Oklahomans 65 and older has declined dramatically, from 39 percent in 1969 to 10 percent in 2012. The rate for children under 18 has risen from 20 percent to 24 percent over the same period. For children under 5, the current rate is 31 percent. • For a disproportionately high number of Oklahomans, a job does not provide a ticket out of poverty. Oklahoma has the nation’s third-highest rate of people working at or below the minimum wage of $7.25 an hour, according to the Bureau of Labor Statistics. A single parent who works full-time at minimum wage and has one or more dependents still falls below the poverty line. 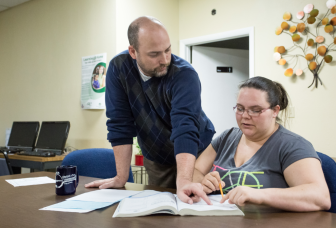 “The face of the poor for us are generally people who are working,” said Andrew Rice, executive director of Variety Care Foundation, which supports a group of low-cost health clinics across the state. It’s an endless debate that goes something like this. Supporters: Federal programs like food stamps and unemployment benefits soften the blow of poverty and make it easier for poor people to make positive changes in their lives. Critics: Government subsidies lull poor people into a cycle of dependency by giving them just enough to get by, often without working. Darrishae Potts, who has seen poverty up close, said both sides have it right. Darrishae Potts, of Oklahoma City, depends on government aid to support herself and her daughter Azariah, 7, but is striving to get college degrees and launch a career. Potts, 24, grew up in a poor family in Oklahoma City. She’s the oldest of her mother’s five children. She has five other half-siblings on her father’s side. 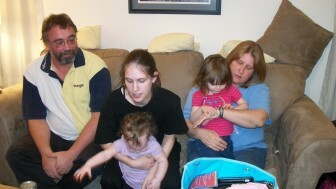 When Potts was 17, she gave birth to daughter Azariah, who is 7 now. The father is no longer in the picture. When Potts was 18, her mother’s boyfriend killed her mother and then killed himself. Potts became the legal guardian of younger brother Alondo, now 11, and sister A’Nari, 9. Like other people in her family, Potts relies on government anti-poverty programs to help make ends meet. She said she receives about $830 a month from Social Security for taking care of Alondo and A’Nari. She gets a monthly food stamp allotment of about $430. She pays just $95 a month to rent a house, with Section 8 housing subsidies picking up the rest. She’s not working and receives Pell Grants to help pay her tuition at Oklahoma State University’s branch campus in Oklahoma City. Unlike other family members, though, Potts said she is determined to leave government aid behind. She just received an associate degree in police science and plans to begin work this fall on a bachelor’s in criminal justice. She wants to become a probation and parole officer for juvenile offenders. Other family members have chosen a different path, she said. “My family is pretty strong. But since it’s offered to them, that’s how they get by,” she said. According to the Census Bureau, 637,429 Oklahomans fell below the poverty level in 2012 — $11,170 for a single person, $15,130 for two people, $23,050 for a family of four. The figures are based on federal estimates of the amount of cash income it takes a family to cover basic expenses such as food, housing, utilities and clothes. The big decline in poverty among the elderly is perhaps the most striking accomplishment of the 50-year period. Census Bureau analysts say it is a nationwide phenomenon, and reflects the expansion of Social Security benefits to include many people who weren’t covered when the “War on Poverty” began. Besides age, several other key factors jump out of the welter of government statistics for 2012, the most recent year for which data is available. * Work status: Most poor Oklahomans are unemployed or underemployed. Excluding children, 17 percent did not work during the previous 12 months, while 32 percent worked part-time or part of the year. Only 11 percent had full-time, year-round jobs. * Family structure: Two-parent households are much more financially secure than single-parent families. 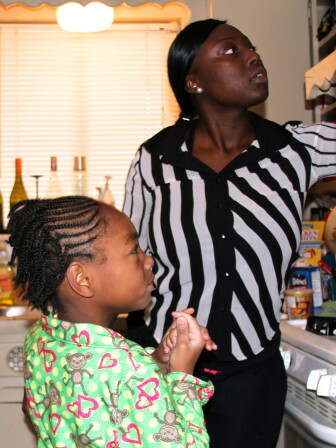 The poverty rate for Oklahomans in single-parent households headed by females is 37 percent. In married-couple families, it’s 9 percent. * Education: People with less education are far more likely to be poor. The official poverty rate is 28 percent for adults over 25 who didn’t finish high school, 15 percent for those who stopped with a high school diploma, and 5 percent for those who completed college. * Race and ethnicity: The poverty rate remains much higher for African-Americans —30 percent — but Oklahoma’s rapidly-expanding Hispanic population is not far behind at 29 percent. The poverty rate is 23 percent for Native Americans. Although the rate for non-Hispanic whites is comparatively low — 13 percent — the population of poor whites outnumbers all the other groups combined, at 336,400. Census Bureau analysts say their official poverty figures actually understate the gains made over the last five decades because they don’t take into account the value of non-cash assistance such as food stamps and housing subsidies. Government programs have helped keep poverty in check, according to Census Bureau researchers. But they are fighting against several big fundamental trends putting upward pressure on the poverty rate. Among them: The globalization of the labor market has reduced pay rates for unskilled work, making it more difficult to earn a living wage. Meanwhile, the declining percentage of two-parent families has pushed many families below the poverty line. Advocates for the poor and poor people themselves say it’s unrealistic to expect government programs to eliminate poverty in Oklahoma, or America for that matter. They say the causes of poverty are many, and the roots run deep. Government assistance may have reduced the pain of being poor over the last 50 years, but it hasn’t, and probably never could, make it go away. Life just creates too many complications. In Oklahoma, for example, high rates of incarceration have created a population of adults and children particularly vulnerable to poverty. While inmates serve their time, they are unable to provide for their kids. After their release, many find it difficult to obtain decent jobs that will enable them to escape the cycle of poverty. 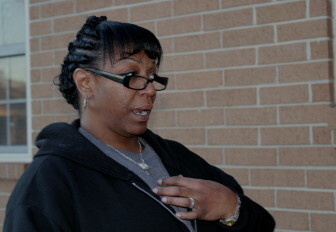 Patrice Wooden-Azebbar, 48, has been looking for a good job on and off since she was released from prison in 2008 after serving time for drug and larceny offenses. She spent a couple of years working for nonprofit groups, but the jobs disappeared when the organizations folded. Patrice Wooden-Azebbar, of Midwest City, is a former prison inmate who has turned her life around but still battles poverty and unemployment. She’s redoubled her efforts since her second husband, a Moroccan roofer, was detained by federal immigration officials about a month ago and sent to a detention facility in Tulsa. Without his income, Wooden-Azebbar has no financial support other than money provided by her 66-year-old mother. She and her mother currently live together in Midwest City. Wooden-Azebbar said she had been receiving $182 in a month in food stamps, but it appears she will no longer get that because of federal budget cuts. 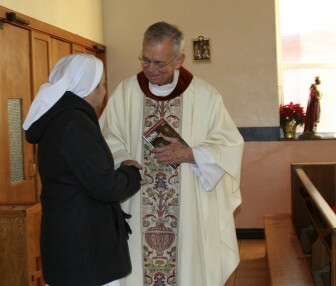 Father Michael Chapman greets a member of his congregation for morning Mass at Holy Angels Church in Oklahoma City. Father Michael Chapman was a 22-year-old seminary student at Cardinal Glennon College in St. Louis when the War on Poverty was declared. Johnson’s initiative was an important milestone in what Chapman sees as a necessary and never-ending partnership between the public and private sectors to try to address the root causes of poverty. “There’s a phrase I learned in the seminary — charity always evolves into justice,” said Chapman, now 72 and pastor of Holy Angels Church, a predominately poor, Hispanic congregation near downtown Oklahoma City. “You can’t just stick with giving out Christmas baskets. That doesn’t work. If one year you decide to give them a Thanksgiving dinner and the next year you don’t do it, well, you’ve lied to ‘em,” he said.